If you picked up a copy of Super Mario Party over the weekend, you've probably already experienced the strange blend of fun, laugh-out-loud gaming and sudden, utter hatred for those who used to be your closest friends. Well, if you want to be the life of the party - and, crucially, take home first place every time - this may well be the article for you. A Reddit user going by the name of Trilerium has been super busy since the game's release, analysing each and every character's unique dice abilities to see who comes out on top. The findings have been shared in a Google Doc, which takes into account the average dice roll you can expect to get with each character, rolls that can generate coins (the yellow segments), and more; be warned, though, that minor spoilers will reveal characters which aren't unlocked from the start of the game. One of the main things to take away from this is that, while being potentially risky at times, Boo, Bowser, and Wario are your best bets for travelling long distances around the board. 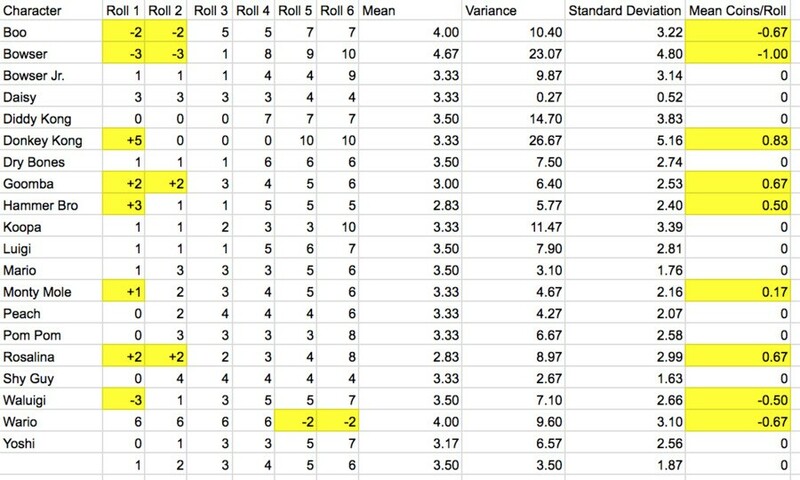 Of course, all characters are able to use the standard dice (the blank entry at the bottom), but those characters' special dice have the highest average movement possibilities. Among the worst are Hammer Bro and Yoshi - which is an absolute travesty in our opinion - and characters such as Donkey Kong, Goomba, and Rosalina are the best options if you're hoping to collect lots of coins on your journey. So there you have it, Bowser can stomp around the board at speed, Donkey Kong will make you rich quick, and Yoshi is - well, Yoshi's a bit rubbish. So, No More Luigi Wins by Absolutely Do NOTHING ? Bullpoop favours Yoshi though. He gets all the bonuses and bullpoop double stars in a single turn. Yeah, but the average dice roll doesn't take the potential for lost coins into account. So what's really better: an average roll of 4.67 with a high standard deviation and average of one coin lost per roll, or a lower but more consistent average roll with no potential for lost coins? That's harder to quantify. Doesn't matter, I always pick Wario in these games no matter what. @Dr_Corndog We also need to work out what a '1' movement roll value is in coins, a coin to space value. Spaces are more valuable as you can only really get spaces through your dice roll, coins can be gotten in many other ways. I'd say a dice with all movement is better than any that give or subtract coins. Though having said that I do like Wario's dice. Personally I’ll take shy guy every day for the consistency. Haven’t lost a game due to bad rolls yet. Edit: also glad to see that they nerfed Rosalina a bit. Her dice was ridiculously OP at E3 if I remember correctly. It was basically Bowsers block but you moved every time. Edit 2: After several more games it's close between Shy Guy and Wario. I have realized that losing coins is almost never too bad and Wario has 6s instead of 4. Erm... I believe this research assumes a uniform distribution for the probability of any face on the dice. It might be implied but I'm not sure whether it is true. @Dr_Corndog This game is fairly generous with coins, and the star cost has been cut in half from previous games. So I'd say the raw movement potential outweighs the coins lost, especially if you're good at mini-games. At least in regards to racing around a board. That being said, there is also some value in the consistant blocks, like Shyguy or Daisy, because it allows you to land on specific spaces more often. Which is good for gaining bonus stars, allies, or event spaces. This makes them really good on the Megafruit board, for instance. But overall, dice that are both inconsistant AND low numbers overall are objectively trash. Unfortunately Yoshi fits both of these criteria. You're flat out better off using the default die 90% of the time. @Pluto14 I see. I thought it was one step and a coin. That makes more sense. I still pick Yoshi regardless because, well, he's Yoshi. But I find this balance of character dice blocks to be pretty laughable. But uh, at least if you need to avoid rolling a 4 or a 6, Yoshi's dice block is good for that at least, somewhat? ...yeah I don't know. I've played a couple boards now (with Yoshi) and I've used his dice block only once, maybe twice. It really is rubbish, sadly. See, if both those threes were fours, then it would already be a lot better for that alone and it would be a bit more inline with some of the other dice blocks without being too good. Who balanced these dumb things? Yoshi was also the weakest Mario character in Rabbids Kingdom, the poor fella isn't getting much love these days! @Adrevenue Same here. Some I understand the analysics, but have an 80% chance of always rolling a 4, IMO is best for me. Average 4.67 spaces for Bowser, which really is more like a 5, but in some boards where special events are triggered, having a high roll isn’t always the best move. @SmaggTheSmug They'd better buff Yoshi, or I'm taking the game back. Mario Party should be an e-sport, get outta here with this casual nonsense! That won't stop me from picking my buddy Yoshi. @Switch_will_fail Somone report this parasite. I actually appreciated that someone went through the trouble to put this analysis together. I made it to a Nintendo Life article! @JamesR I assumed that there was a uniform distribution. In practice thought, I don't know. The dice may be loaded but I don't have the time to test, or the knowledge to dig into the code. @Octane monty's 1 is actually a +1 coin (effectively a zero for movement) which drags the mean down. 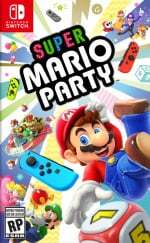 @Octane this is my first Mario Party, grew up with limited access to console games. So I have a lot of catching up to do. @Trilerium This is definitely a pretty good one. But it's far from what I'd consider the best. If you can handle jenky graphics, and can get your hands on them, it's worth checking out the old ones. MP 3 was probably the best, but 2, 4, 5, 6, and 7 all were at least decent. 8 and up is where it got a bit iffy. @Heavyarms55 If you want people who are try-hards at Mario Party, I'd direct you to the Youtube channel Friends without Benefits. They have it down to a science, and it's absolutely ridiculous. ...otherwise, not really. I do because I'm cursed to take every game I play far too seriously, but I'm weird. I have only played a couple rounds so far, but it seems like the "random" rolls for anything heavily favor Mario. In both cases Mario had a far luckier time than any other character, leading us to wonder if the most popular characters have better hidden stats. I'm in it for the fun, so I'm not going to plot hundreds of rolls for each character, but the chart is rather meaningless if it doesn't include the actual probability of any given dice block. In addition, it appears the base character may impact the dice block of an ally block. 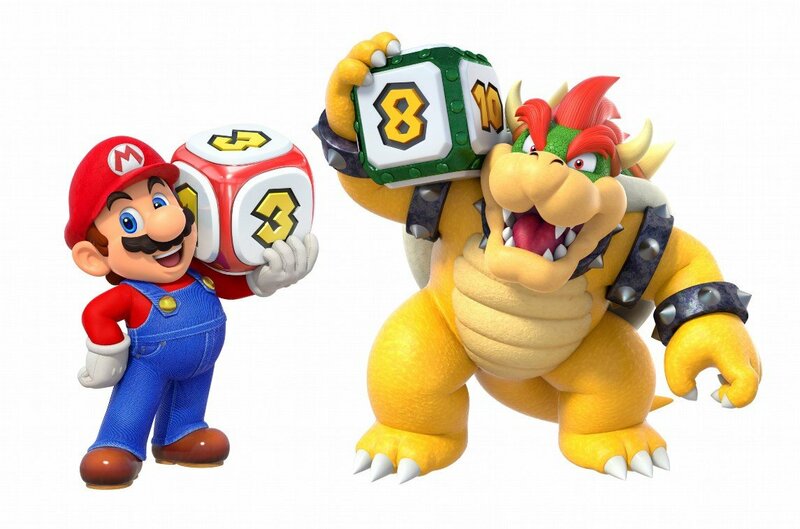 When Mario used Bowser's block there were three consecutive rolls of 10 followed by a 9. The next round when Hammer Bro used Bowser's block the rolls were nowhere near as good. This is an observation from very limited data and Mario Party has proven to be very random with players jumping all over the scoreboard. I would point new players to Mario, though, even if it is just in my head. @Octane Monty can't roll a 1. His first roll is +1 coin. @Octane The 1 is a +1 coin that doesn't count towards the average. How many people are going to point out the "that 1 is a coin, not movement"? Donkey Kong looks good with both the "average" roll of the other characters AND the highest coin income. Almost everyone else that earns coins has a reduced average. Waluigi is pretty bad though. While it does get a 3.5, so does Mario, Daisy and Dry Bones, but they don't have the coin penalty. I don't know if staying in place is good for the game, but Daisy is move or not with all 0 and 7. While Dry Bones at least move each time with all 1 and 6. @Dr_Corndog Unless you are tight on coins and a star is up for grabs movement trumps any coin gain/loss probability. You aren't gonna win the game by getting coins with your dice and you aren't gonna lose the game because of lost coins either. The best way to win the games imo is to get a consistent dice (shy guy, wario, boo) and win the minigames. @JamesR It might just be me but it seems that the more you use a dice block the more unlucky you get with it. For example at the beginning of a game I got 5 straight 6s with Wario which has a 13% chance of occurring which is rare but it might just be luck. However after that I rolled 5 -2 coin rolls only a staggering .4% probability (I triple checked the math) bringing that sequence of events to an insanely low .052% probability. It could have just been a strange event but that seems unusually bad for an ingame occurance since a computer would normally be decently consistent unless somehow weighted. I'll have to play around more to know for sure though.